A tuka or spirit shrine near a hut with a child and woman outside. It consists of a split stick, the ends bound at the top, with a straw hat placed within. There are ritual offerings below alongside magico-religious plants growing around the base, such as ranga ambiri (against wild animals) and possibly also sarawa (food-medicine). Such shrines are sites for medicines or ngua that are invoked to ensure ancestral (spirit) favour for the inhabitants of the homestead. Contemporary Publication - Reproduced as Plate LIXa (facing page 528) In C.G. 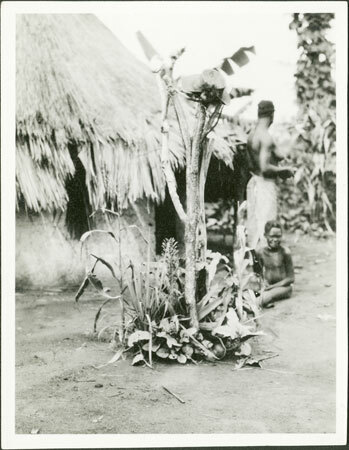 & B. Seligman's Pagan Tribes of the Nilotic Sudan (London, Routledge 1932), with the caption ' Tuka , with "medicine" growing at base'. Notes on card mount m/s pencil - "slight edge fading 12/11/86"
Morton, Chris. "Zande spirit-shrine in homestead" Southern Sudan Project (in development). 03 Jan. 2006. Pitt Rivers Museum. <http://southernsudan.prm.ox.ac.uk/details/1998.341.13.2/>.